Q: My desktop is a frightful mess. Is there a quick and easy way to make it more manageable? A: The Desktop is the bane of most of our lives. We put everything on it, mostly because it’s convenient, quick and easy, promising ourselves to stash it in a better place when we’re done with it … but we hardly ever do. So, what happens? It becomes progressively filled with file after file, folder after folder, until it becomes a herculean task just to find that one file you were looking for. 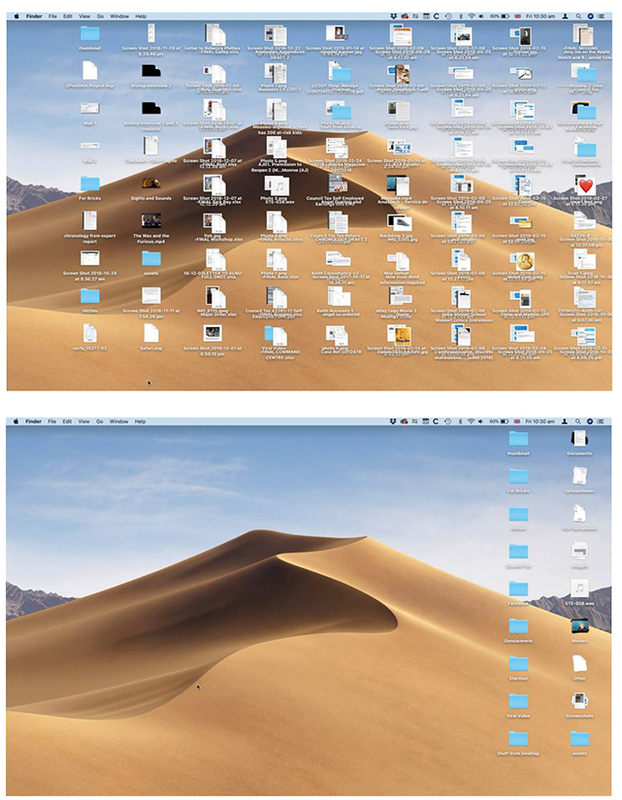 Apple have tried many ways to help you organise this virtual landfill: make sure you have no Finder windows open and you’re looking at your Desktop; next, go to View > Clean Up By. This opens a submenu where you can organise your Desktop files by kind, name, date created, etc. This feature has been available for decades but isn’t ideal. For one thing, you have to go this each time a new document is added before the Desktop mess becomes unwieldy again. So, with the latest version of the operating system, Mojave (Mac OS 10.14, available as a free download from the Mac App Store), Apple have come up with Stacks. To activate it, go to View > Use Stacks, and all of a sudden your Desktop appears uncluttered and organised: spreadsheets are together, as are PDFs, etc. Click on a Stack and it opens up to reveal its content. Click on it again, and it closes. And when a new file makes its way to your Desktop, it’s automatically sorted into its proper Stack. www.baymacs.co.uk, provides consultancy, training and troubleshooting services to the Swansea area. You can email him at help@baymacs.co.uk or contact him on 077-8866-0407.